Now, more and more news about the whales’ visibility in southern Cebu spread, rapidly reached me, and I insistently told myself, NO. An invitation came from Bee early January and she said they’ve (she and some acquaintances) plans of going to the place and asked if I and a few friends would come along. I said, “I’d think about it”. And so we did. I brought along a few more curious friends, Rhandy and Melvin, Lorie brought a wagon of five, and Bee, the master initiator. I have to be honest, their companionship was comforting. I would like to think they thought of me the same way (naughty grin :D). We arrived at Oslob just about 3 hours from the city. Although none of us knew exactly where the spot was, let alone Lorie and her troop who started the trip from across Cebu via fast craft, we knew we’ve arrived after seeing the glaring signs and billboards of Butanding right along the road kilometers away from Oslob proper. A crowd of people was our welcome scene and they were just all around the registration area which you wouldn’t even notice existed. Without delay, we enlisted ourselves and as we waited more and more people came in from different places and of different races. When it was our time to meet and greet the sea giants, we hurried putting on the Php20.00 life vest which looked like a worn out cloth sewn around a styrofoam. Then, the heart’s drumbeats began. And because we were so preoccupied keeping our balance in the very small canoe we were on, we became more fearful of a capsizing boat than the anticipated shark encounter. I, in fact, had to busy myself scooping volumes of water off the boat. For some reason, I felt that the boat had an orifice that’s keeping the water in but it wasn’t perceived as an impediment. In fact, we shrugged it off our shoulder fast when boatmen and curious lads started shouting in excitement at the sight of the humongous whale sharks. They looked playful as they swam after boatmen who kept feeding them a handful oftiny shrimps. 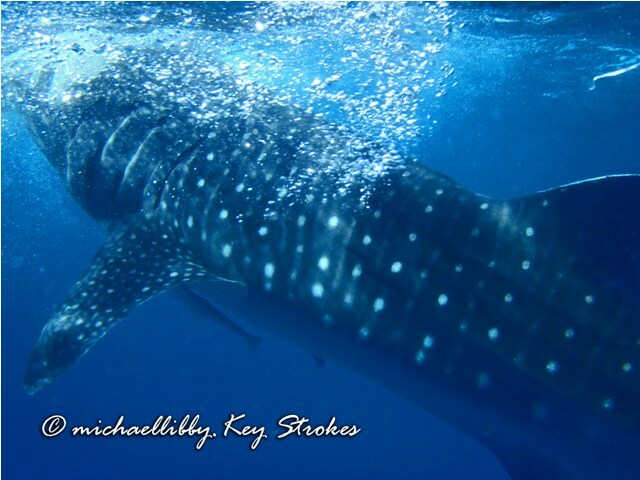 When they started swimming round and about our boat, I knew it was time to swim for a fuller view of the fish. 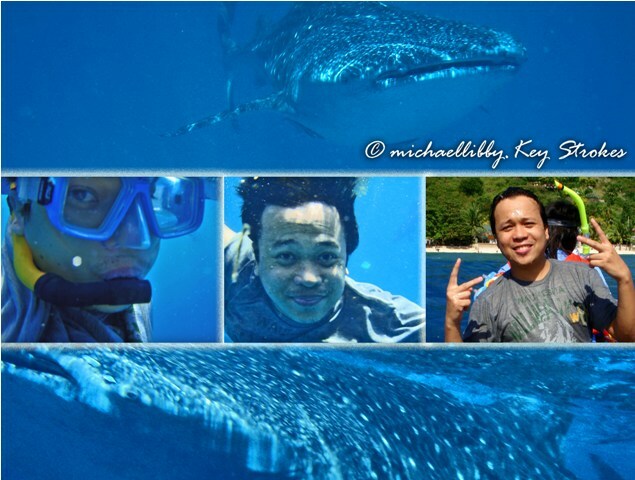 Using Bee’s water-proof camera, I took pictures of the beautiful whale sharks underwater. I was wowed in amazement of God’s countless masterpieces. I’ve seen beauty on land, but the water creatures were just as beautiful in many different ways. I wanted to touch them but pang of fear and self-restrictions held me. They were so close that I could just reach my arm out and I know my fingers will touch them. Afar, they look small but as they come near, their size grows way too large. And because I wasn’t too far from the water surface, I could hear my friends’ muffled voice saying, “…look behind you.. There’s more.” When I veered, I caught sight of one swimming right straight to me, and as if curious of Bee’s vibrant pink camera, it paused for a while and moved closer. Trembling to keep myself in composure with one arm on the boat’s outrigger ready to pull myself up anytime it lunges, I extended the ready arm with the camera to take a shot. To my disappointment, I must’ve moved too much that I caught only its back side as it started swimming away. There were a few more sightings, but not as close as that moment. I refused to end the adventure without me taking a snapshot of myself with them somewhere in the background, but their speed was way beyond mine, besides, I only had myself to do it. My friends weren’t anywhere near skillful divers and the boatmen were busy keeping the vessel running, or “afloat” (tsk!). We headed back home with everyone else content except me who jestingly whined like a crazy child who got a little short-served. All for the want to get a good shot of myself with sharks behind. Haha! Overall, it was a splendid experience and over-the-top start for year 2012 for me. Leave Cebu City from the South Bus Terminal early in the morning to avoid the crowding mob of whale shark sight-seers. The earliest the boatmen bring you to open sea, the lesser sunburn you get. - Do not use underwater motorised diver propulsions. Bring lots of sunscreen lotion for skin protection. Anyone who’s drank shots of tequila would have a feel of what that statement meant. 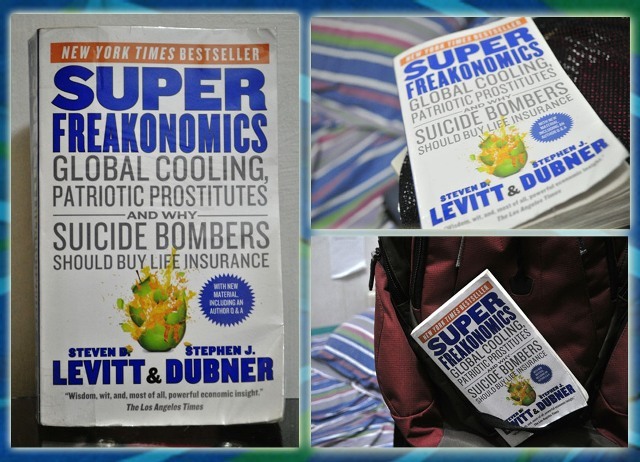 SuperFreakonomics is a book I chanced once when out of boredom in the office, I decided to pay Fully Booked a visit. I often go to that bookstore because you know that if you’re just good at eyeing a quiet spot, nobody is going to look you in the eye sharply while you slide your fingers in the book pages on display. The paperback SuperFreakonomics book I read until the pages curled and the cover ripped at the edge... woops! Mr. Levitt and Mr. Dubner, whose first names sort of sound alike (Ste”v”en), Steven and Stephen, respectively, did a great job in collaborating for the completion of this phenomenal book. It felt so good and sounded so right the moment I turned the first few pages of the sacrificial item on display. It must have been the straightforward and candid writing style that kept me glued to it. They write it like they speak it in a casual conversation. This style makes reading smooth such that you wouldn’t know that you’ve in fact flipped the last page of the first chapter already. While my colleague at work was convinced to buy it after reading the first line of the explanatory note: “The time has come to admit that in our first book, we lied. Twice.”, mine was influenced after learning that both authors considered themselves civil writing adversaries at first before they decided to collaborate. Further onwards, I learned that they’ve decided to pair up for this project, besides the financial incentives, for the reason that when summoned to answer about how much share each of them should get, they both blurted “60-40”, the bigger percentage in favor of the other. As to what was eventually agreed upon, it remained undisclosed. The book was such a delight that it can indeed pass for a Chicken Soup for the Freakonomics Soul or a Coffee Mate (like sugar to bitter coffee is a sweet blend). It makes reading dull science,economics, and statistics books fun. It was likened to a ‘swig of tequila’ by The Times in London, because it is the kind of book that breaks the barriers of categories. It has a genre of its own. The topics are interestingly varied that it touches most of the real and current issues our world is facing at present: Prostitution, Terrorism, Global Warming, Drinking Drunk, Apathy and Altruism. Your acquaintance, after reading the book, can range from a prostitute, who goes by the name LaSheena, to huge names in politics like Al Gore, and Microsoft personalities like Nathan Myhrvold. Its scientific explanations and statistical data makes reading feel like you are just watching news on TV. My most liked part of the book is Chapter 5 which tackled the commonality of Al Gore’s advocacy with the historic eruption of Mt.Pinatubo in relation to global warming-- both views quite identical objective-wise but different when cost is concerned. I will not go into the details so as to leave you with a whole lot of surprises to enjoy. You can purchase a copy of the book in many bookstores Nationwide or buy it online via Amazon.com. Book price varies depending on book size and type. My friend now owns a paperback at roughly 8 USD. When typhoon Sendong hit the country, I’d confess to have become quite indifferent until a confrere started sending me a Facebook message asking about my hometown’s condition after that historic day on December 17, 2011. Posts about the news began populating on social network pages and you can’t help but notice and pry. As I browsed and read through each item, I was suddenly struck with the need to contact my family members to check on their safety. I regained my calmness after knowing that the typhoon brought only up to 2 inches deep rainwater within our vicinity. 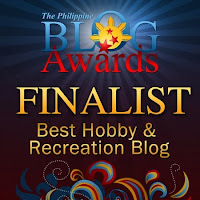 That is because, our house was located on a higher ground compared to our not too distant neighborhood which was situated near the Banica River in Bagacay, Taclobo, Dumaguete City. I saw pictures of the raging water from my dad’s FB profile and one can only imagine how much panic it brought to the families whose house and properties where built and stacked at the riverside. Other areas in Dumaguete showing infrastructural and property damages were Freedom Park which looked like a pool of muddy water and Colon Extension (mostly houses along the riverside behind Foundation University). 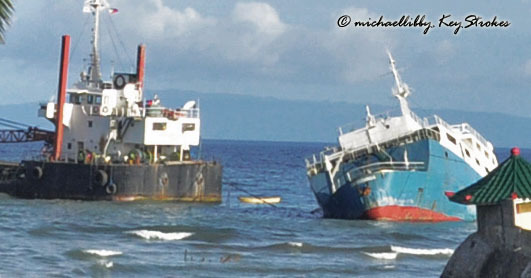 Residents of Calindagan, on the other hand, were stirred to rescue action when a cargo ship (MV Ever Transport III) wasoverturned by smashing waves taking the vessel to the shore. A crew of 28 was rescued to safety. While this horrendous event happened in our town, neighboring towns too had their share of tragic stories. Among the others affected were the following towns: Amlan, Sibulan, Tanjay, Siaton, Bacong, Valencia, and Pamplona. Negros Chronicle reported a total of 43 fatalities, 19 of which were from Valencia. Property damage totals to 380 hectares of fishponds, 381 farmlands, 280 hectares or rice plantation, and 18 hectares of corn plantation as published in The Visayan Daily Star. A bridge in Tanjay (see pictures) also collapsed causing transportation problems for travelling town folks. This news was confirmed to me by our apartment landlady whose house-help was in transit to Bais City when it happened. Radios and Television air news about how much worse typhoon Sendong (international name, Washi) affected other regions of the Philippines like Iligan and Cagayan de Oro. Panic has spread fast and tales of survival and of losses were people’s everyday conversation. Natural calamities are sometimes the most difficult to process. Crimes like murder and robbery most of the times point to suspects with motives and intentions. Typhoons, hurricane, flash flood, and earthquakes on the other hand claim more than one death but without a particular person to blame. Investigations for this type of misfortune may identify a community activity (overcutting of trees, including illegal ones) but will never put a man to jail for all fatalities. Affected families remain in abstraction both of what could have been done and what to do next. If one is lucky, he/she can bounce back quickly, but the non-resilient are stuck in oblivion, caught between the then and the now, seeing no clear future. The government and its effort to bring relief goods and assistance to the families who have been affected by this unfortunate event are commendable. I believe it is a good start towards recovery---the restoration of tangible things and the availability of resources for the victims’ basic needs. However, the challenge to boost back confidence and courage for these victims remains. As to when full recovery can happen--it is difficult to tell. Apart from the external motivation one can get from others, it is mostly a decision one needs to make to free himself from the baggage of the past and catch up with lost times (Philippians 3:13). Personally, it is the glimpse of an imperishable future that keeps me going. Knowing that death and defeat are temporary and that real victory lies ahead keep my head up. May all, especially the Sendong victims, recognize that our times are in God’s hands (Psalm 31:15). I know it ain’t easy, but may all who understand, become a ready encouragement for others to keep trying. Keep going!